Dinosaurs are often depicted as fierce creatures, baring their teeth, with tongues wildly stretching from their mouths like giant, deranged lizards. But new research reveals a major problem with this classic image: Dinosaurs couldn't stick out their tongues like lizards. Instead, their tongues were probably rooted to the bottoms of their mouths in a manner akin to alligators. Researchers from The University of Texas at Austin and the Chinese Academy of Sciences made the discovery by comparing the hyoid bones — the bones that support and ground the tongue — of modern birds and crocodiles with those of their extinct dinosaur relatives. In addition to challenging depictions of dino tongues, the research proposes a connection on the origin of flight and an increase in tongue diversity and mobility. The research was published June 20 in the journal PLOS ONE. "Tongues are often overlooked. But, they offer key insights into the lifestyles of extinct animals," said lead author Zhiheng Li, an associate professor at the Key Laboratory of Vertebrate Evolution and Human Origins of the Chinese Academy of Sciences.He conducted the work while earning his Ph.D. at the UT Jackson School of Geosciences. The researchers made their discovery by comparing the hyoid bones of extinct dinosaurs, pterosaurs and alligators to the hyoid bones and muscles of modern birds and alligator specimens. Hyoid bones act as anchors for the tongue in most animals, but in birds these bones can extend to the tip. Because extinct dinosaurs are related to crocodiles, pterosaurs and modern birds, comparing anatomy across these groups can help scientists understand the similarities and differences in tongue anatomy and how traits evolved through time and across different lineages. The comparison process involved taking high-resolution images of hyoid muscles and bones from 15 modern specimens, including three alligators and 13 bird species as diverse as ostriches and ducks, at the Jackson School's High-Resolution X-Ray Computed Tomography Facility (UTCT). 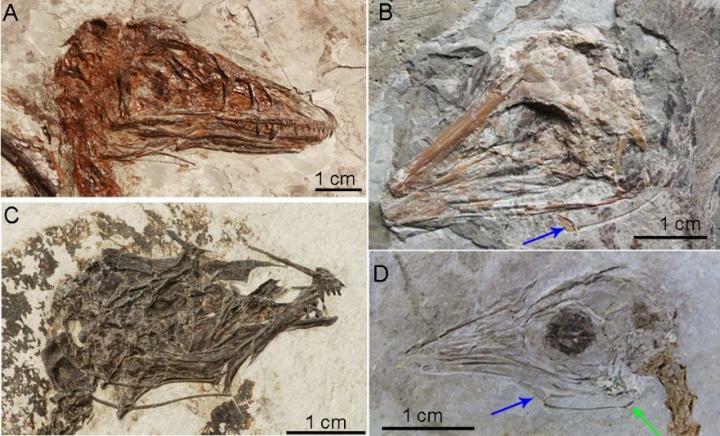 The fossil specimens, most from northeastern China, were scrutinized for preservation of the delicate tongue bones and included small bird-like dinosaurs, as well as pterosaurs and a Tyrannosaurus rex. The results indicate that hyoid bones of most dinosaurs were like those of alligators and crocodiles — short, simple and connected to a tongue that was not very mobile. Co-author and Jackson School Professor Julia Clarke said that these findings mean that dramatic reconstructions that show dinosaurs with tongues stretching out from between their jaws are wrong. "They've been reconstructed the wrong way for a long time," Clarke said. "In most extinct dinosaurs their tongue bones are very short. And in crocodilians with similarly short hyoid bones, the tongue is totally fixed to the floor of the mouth." Clarke is no stranger to overturning dinosaur conventions. Her 2016 study on dinosaur vocalizations found evidence that large dinosaurs might make booming or cooing sounds, similar to the sounds made by crocodiles and ostriches. "Birds, in general, elaborate their tongue structure in remarkable ways," Clarke said. "They are shocking." That elaboration could be related to the loss of dexterity that accompanied the transformation of hands into wings, Li said. The scientists note one exception linking tongue diversity to flight. Ornithischian dinosaurs — a group that includes triceratops, ankylosaurs and other plant-eating dinosaurs that chewed their food — had hyoid bones that were highly complex and more mobile, though they were structurally different from those of flying dinosaurs and pterosaurs. Further research on other anatomical changes that occurred with shifts in tongue function could help improve our knowledge of the evolution of birds, Clarke said, giving an example of how changes in the tongues of living birds are associated with changes in the position of the opening of the windpipe. These changes could in turn affect how birds breathe and vocalize. However, the researchers note that the fossil record as yet can't pin down when these changes to the windpipe occurred. "There is more work to be done," Li said. The study was funded by the Chinese Academy of Sciences, The University of Texas at Austin, the Smithsonian Institution and the Gordon and Betty Moore Foundation.